Information Today’s excellent Computers in Libraries conference took place in Washington DC last week and featured top-notch presentations by librarian on the cutting-edge of technology. If you didn’t get a chance to attend you’ll want to check out these great presentations by talented info pros! This session looks at the strengths, scalability, and flexibility of WordPress for library applications. 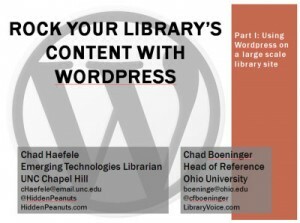 Haefele describes how UNC Libraries selected and implemented WordPress as a content management system for their large university library website. Take a look at the power, ease of use, and customization offered by WordPress as well as tips on supporting a complex site.With years of experience using WordPress to power his business blog, a website designed to help business researchers at his institution, Boeninger demonstrates why he prefers WordPress as an alternative to commercial applications such as Libguides and showcases plugins, taxonomies, and techniques for organizing and promoting library research guide content. Think redesigning your website is a big task? Imagine tackling 30,000 hand coded web pages. The UNC team did just that, striking out to create a user-focused, visually stimulating website built using responsive design. 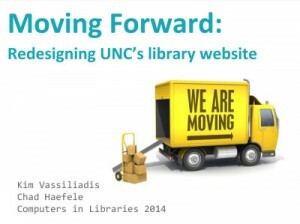 They share insights into taking the UNC library’s web presence to the next level and describe how they analyzed their web presence, conducted usability testing, redesigned content, made design decisions, and developed a content management strategy. Coulter describes Richland Library’s quest to create the ideal library user experience. Transforming Richland’s library site from a portal that sends library users off to different vendor platforms, Coulter shares how it is improving fragmented experience by offering library patrons an integrated user experience via custom modules in Drupal. Learn about the pieces of the integration puzzle and lessons learned as a new library user experience is crafted. 3.) 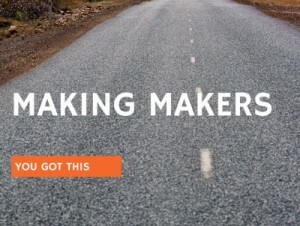 Tools & Idea Blitz: Steal for Your Website! This session looks at some new and sometimes overlooked ways of enhancing the library’s web presence and shares new tools, design themes, and applications. Mairn shows how you can revolutionize mobile phones with your floorplan. He describes how places like libraries or campuses can work with Google to get their physical space mapped for indoor guidance with Google Indoor Maps.When someone zooms in on your library building on Google Maps, floorplans automatically appear. In your library, users would have point-by-point navigation via their Android smartphone or tablet (soon on iOS devices too) to reference desks, study rooms, computer labs, etc. Brandon looks at theming in Drupal and illustrates the steps, from the selection of a base theme to those involved in setting up a subtheme, using HTML/CSS to design multiple layouts. MSU Libraries’ chose the Omega base theme, the second-most-installed theme for Drupal CMS. Working with this theme, MUS Libraries’ web team created a responsive design for their academic library website. Bearden and Mitchell describe some of the hurdles they faced to keep their library website accessible, including a battle with Google.With the pace of tech change and job mobility, the old paradigm of solving problems by knowing who to ask is shifting to knowing what to ask. Find out what to ask when you’re faced with ensuring accessibility of link resolvers, authentication systems, proxy services, and other systems essential to libraries. Sharpen up your skills (and your mind) to help keep your library site accessible. Deschenes looks at custom development of a new tool for sharing information about Simmons College library collections and services with patrons and stakeholders. Many libraries are focusing on measurement and assessment and Deschenes used Zoho Creator as a statistics management tool to share library data. She illustrates a lightweight, dynamic online dashboard built to visualize data stored in a Google spreadsheet using Sheetsee.js. 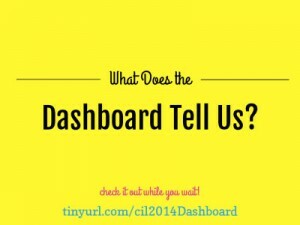 Not only will you have a chance to see the dashboard, you’ll get the steps to create one for your library. Hear lots of examples of library makerspace programs. Be inspired and gain insights and ideas from our practitioners. Uhlmann explores the current state of affordable 3D printers, including the necessary computer hardware and software for the printer, related peripherals such as 3D scanners and cameras needed to digitize 3D objects, as well as filament selection and environmental considerations. He shares technical and cost factors and more. The Bitters talk about The Raspberry Pi, a credit-card-sized computer that can be powered by a cellphone charger. Cheap ($35!) and simple, it can help introduce computer-shy users to the wonderful world of Linux and open-source coding. With a host of uses, from maker projects to minimalist computing, the Raspberry Pi is a low-cost, low-stress starting point for users of all ages to become more technologically savvy. She shares class curriculum and further resources for teaching patrons how to use the Raspberry Pi. Moore shares Darien Library’s experience with mini-makerspace for kids only, including programs and independent projects, and response to an environment where kids can learn, collaborate, create, and tinker. Lynce and Tripodis discuss developing a team of front-line staff to operate, develop, and promote the space and services using their TechCentral MakerSpace to illustrate both practical and nontraditional ideas that you can use to inspire the maker spirit in a diverse staff. Hoge and Diamond-Ortiz share best practices and success stories in developing maker-culture in libraries. de Boer describes FryskLab (http://www.frysklab.nl), a mobile FabLab, the first in Europe. It creates a healthy interest in technology and maker skills, stimulating digital literacy. In a community with a strong history in cultural craftsmanship, the mobile FryskLab had support in schools, small villages, and companies and has a strong collaboration with education. Hear more about their project and plans to organize an open product design session for librarians. Google Glass is Google’s latest consumer technology and is a wearable, head-mounted computer that acts like a voice-activated, hands-free smartphone. Hailed by some and reviled by others, Glass provides a peek into the future of information delivery. In July 2013, Google chose the presenter as an initial “Glass Explorer” — one of approximately 7,000 people wearing, testing, and providing feedback about Glass. 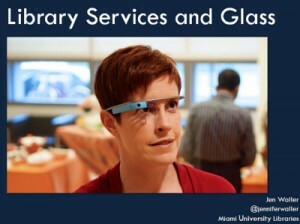 She introduces the features and limitations of Glass, demonstrates how Glass has been used at the Miami University Libraries, and then explores how librarians can begin thinking about providing future services with Glass in mind. The first presentation looks at the steps involved in research and the latest technology tools and apps available for researchers to utilize at each stage of the process: mobile and cloud-based apps allowing researchers to blur the traditional divides between the field and the lab and between the researcher and the participant, all while shortening the time it takes to conduct research, and tools or apps (web-based or device specific) that can assist in the tasks of analyzing, data gathering, and reporting. These apps include note-taking or productivity (EndNote, inScribe, MobileNoter), visualization and conceptualization tools (SimpleMind, MagicalPad, Min- domo, Popplet), online collaboration (itracks Mobile, GRID), data gathering and analysis (Nativeye, EthnoHub), multime- dia capabilities for recording audio and capturing video (CaptureNotes, SenseMaker, TagPad), and data organization and cloud storage (Dropbox, Mendeley Reference Manager). The second presentation focuses on effectively summarizing large and often complex data. 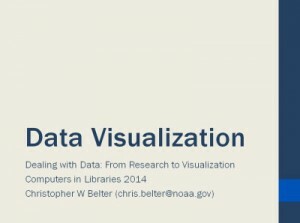 Visualization is a powerful method of conveying large amounts of information in a user-friendly format. Hear about some of the techniques and open source software tools that you can use to create graphs, charts, maps, and network graphics that are accurate, informative, and visually compelling. 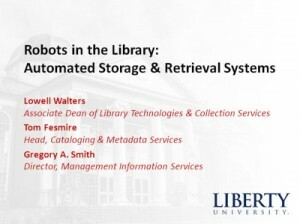 While ASRS (automated storage and retrieval system) installations in libraries are not new, Liberty University’s was distinctive on several fronts: The ASRS vendor had no previous experience in libraries; the library aggressively chose to store some 70% of its main library collection in the ASRS; bins with books were preloaded as construction progressed, allowing for rapid ingestion into the ASRS and subsequent launch of regular retrieval; and the ASRS is a technological showpiece of the new library building. The speakers look at the planning, collection analysis, software development, loading and ingestion, and ILS management. From content aggregation tools and tips for improving your current awareness programs to tools for curation and analytics, Keiser shares her expertise. Using the technique he created to train reluctant librarians to conduct patron needs assessments, Liebhardt shares the secrets of conducting successful interviews for staying close to your customers. Chronister and Rubin provide insights into improving websites and services through user-centered design and explain how to create your own usability testing program on a shoestring budget. Clayman and Bolls describe how their EPA library team enhances user interaction with innovative customer resource management. The librarians supervise the content management system that 26 EPA Offices use to manage their own knowledgebases of frequently asked questions and customer interactions. They share tools and techniques for providing improved access and superior customer service. Holley-Harris talks about lessons learned by one of the DoJ’s libraries on marketing new technologies and engaging users. She covers the benefits of selling new ideas/technology to the library staff before selling the patron, how great turnaround times often trump the technology, and giving technology presentations in under 10 minutes. As students become more adept at using devices, and as schools invest more funds in technology, can students conduct their research projects on their iPads? The presenters created a program at their Lower School in which students brainstormed, questioned, took notes, and produced a final research project using iPads. 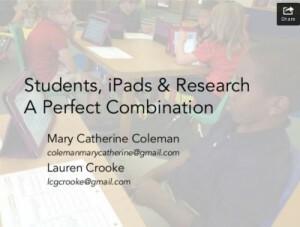 In this presentation, they highlight and discuss the process used to take their students through the research process, and the apps used. They share their process in developing this research program, the steps of the program, and some of their students’ final projects. Looking for ways to use apps in your libraries? 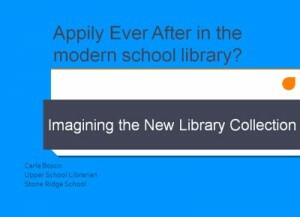 Want to embed Library 2.0 resources in teacher-friendly ways? This panel of school librarians highlights successful implementations and offers strategies for overcoming Library 2.0 challenges. 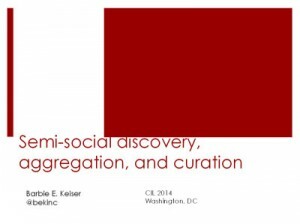 Topics include curating ebooks and apps, app-based research projects, and embeddable tools such as Live- Binders. Using real-world examples, three librarians share their insights, strategies, and tips, providing practical guidance as well as provocative, philosophical conversation.